Facebook is currently one of the most popular and widely used platform at the moment. And while Facebook allows you to add and remove friends from your friend list there is no option where you can receive a notification when anyone of your friends deletes you on Facebook. Am pretty sure most of us might have imagined having an option on Facebook where you get a notification whenever you are been deleted by any of your friends, but unfortunately such feature isn't available on Facebook yet and I really don't see being implemented anytime soon. In this post am just going to show you a Google chrome extension and how to use it. How this extension works is that it downloads all your friend list and notifies you anytime anyone removes you on Facebook. ==> First visit www.deleted.io and install it’s Google chrome Extension or you can just download it from here. ==> Add the “Who Deleted Me” Google Chrome extension to your chrome browser. ==> Click on the added extension and it will automatically check for your friend list. ==> Once finished it will let you know how many friends you have in your facebook account. ==> So once anyone deletes you from facebook, you will get a notification like “You’ve made “(no)” new friends and lost “x(no)” friend. 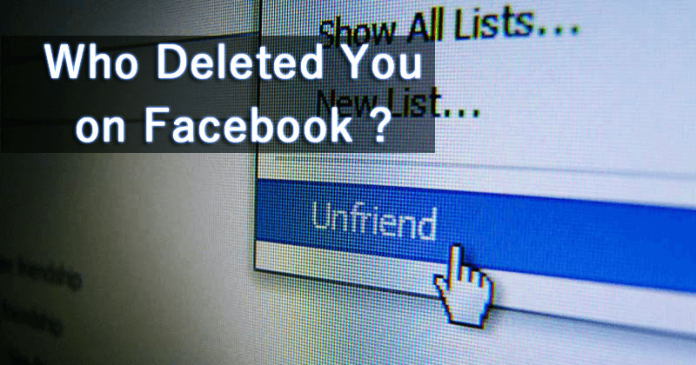 ==> Once you clicked on “Let’s Go See Who” it will show you who deleted you on facebook. That's just a simple way to know who deletes and adds you on Facebook.